In January 1995, shortly after I moved into my first New York City apartment, I called my parents, desperate and a tad panicked. At the time I was a 22 year-old starving actor and I’d recently furnished much of my cramped bedroom with a random assortment of discarded furniture that I’d scavenged from the streets of my Hell’s Kitchen neighborhood. Among the few respectable pieces I possessed was a narrow wooden bed—a loaner from my roommate’s father—that was wide enough for a single mattress. Yet I couldn’t muster a good night’s sleep. Because I didn’t own a mattress. Granny (Mira’s daughter-in-law) not only confirmed its whereabouts (attic, indeed), but enthusiastically quoted its provenance. “It was Uncle Bob’s when he lived in New York, deary,” she said. From her ebullient tone, I felt as though I’d just inherited a priceless diamond ring. Uncle Bob was, of course, Robert Locher, my great-great uncle and Mira’s younger brother. And I was thrilled to inherit one of his possessions. Not because I’d be sleeping on a piece of history, mind you, but because I didn’t have to cough up 500 bucks for a new mattress. It never occurred to me, or, apparently, anyone else in my family, that bed bugs—or worse—might have burrowed inside the weathered horsehair mattress. You see, Uncle Bob lived in New York from 1914 to 1947. That clumpy sliver of a pad, which I nestled into for four years in a scruffy westside tenement, was—at the very minimum—48 years old. The last time Uncle Bob slept on it Harry Truman was president. I itch just thinking about it. The mattress fit my bed perfectly. At night, after returning from my shift waiting tables at an Upper West Side restaurant, I laid on the old “ticking” mattress and thought about what Uncle Bob’s life in New York must have been like. I never met him, but from the stories I heard about him as a kid, I always pictured him as a somewhat Dickensian character, larger than life, a sophisticated and arty dandy, with the grace and charisma of a movie star. During holiday dinners, my grandparents, dad and uncles spoke of his sharp wit and famous friends: the photographer Man Ray, playwright Eugene O’Neill and writer Gertrude Stein—to name a few. To me he sounded like a mashup of Cole Porter, Noel Coward and Oscar Wilde, rather than someone who’d grown up in conservative Lancaster County. 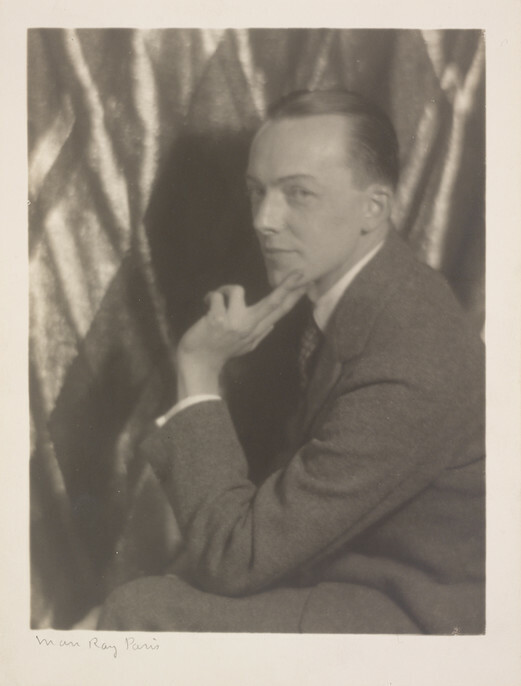 He’d hobnobbed with the literati and traveled extensively to Europe and Latin America, designed interiors for Mrs. Whitney and costumes for Broadway shows. As I listened to these tales and reminisces, I beamed knowing that I was enjoying a meal at the very table he once sat. I thought, I hope my life will be just as exciting. Robert Evans Locher was born in 1888 and grew up on South Queen Street, the son of Charles, a banker, and Lila (née Reno). The youngest of five children, his three older siblings included my great-grandmother, Mira, who was 11 years his senior. He attended Yeates Episcopal School on North Duke Street, where, via acting in school plays, he was first exposed to a life in the theatre. Artistically inclined from a young age, a career in the fine arts would prove challenging, however. When he was 16, his father, Charles, died. Shortly thereafter the family business, City Savings and Trust, folded. Locher and his mother moved to East Petersburg where they lived with his aunt. As Bruce Kellner wrote in a Demuth Museum newsletter in 1994, Locher’s oldest brother David, “dissuade[d] the boy’s artistic bent in arranging for him to become an apprentice draughtsman to a local architect.” Locher also spent a year at Warburton Business College in Philadelphia and took classes at Potter Architectural School. From a young age, due to a variety of family pressures, Locher was destined for a life in the commercial arts. It was likely during his apprenticeship, in 1909, that Locher, then 21, met Charles Demuth. (At least this is the first documented meeting between the two men. As Kellner writes, “class distinctions as well as mutual interests may have readily brought the two together when they were boys.”). Demuth was five years older than Locher, but the two became fast friends and remained close until Demuth’s death in 1935. In 1914 Locher moved to New York City and a year later he married Beatrice Howard Slack from Brookline, Massachusetts. Slack came from Boston Brahmin stock and the pair lived on a large estate on Staten Island, occasionally vacationing in Europe. Little is known about the marriage, although Kellner states it was “widely considered to be a marriage of convenience.” (Like Demuth, Locher was gay.) Still, their marriage lasted for 18 years until their divorce in 1937. She remarried just four days later and shortly thereafter built Pride House on Fire Island, a small bungalow that became a popular destination for gay artists. 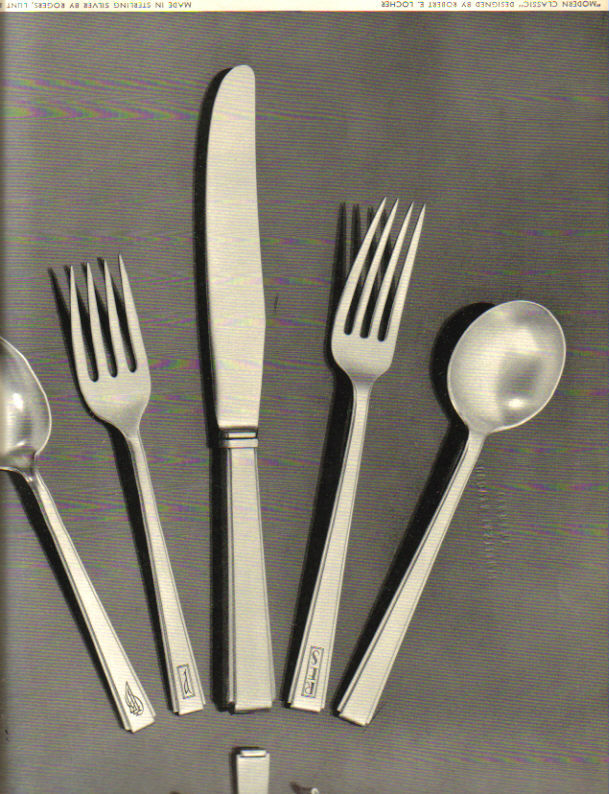 As for Locher’s career, he moved effortlessly between mediums, designing sets and costumes for Broadway shows, illustrating for Vogue and House and Garden (where he worked as an associate editor), creating his own line of flatware and tea sets, designing interiors for wealthy clients and numerous book covers. The depression didn’t spare Locher. Charles Demuth recognized this and ensured Locher would be taken care of after his death. When Demuth died in 1935, he bequeathed both the family home on King Street and his watercolors to him, which, when sold, provided Locher with a much-needed source of income. 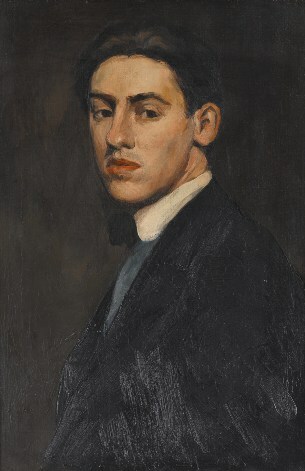 Locher eventually inherited the house and paintings after Demuth’s mother, Augusta, died in 1943. 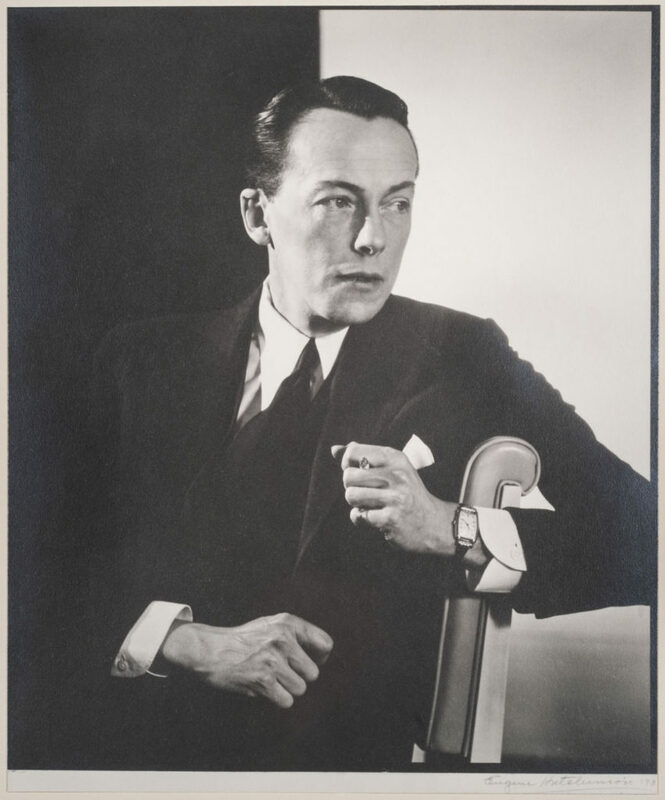 Subsequently Locher and his longtime partner, the dancer Richard Weyand, returned to Lancaster from New York and opened a clothing store and an antiques store on the premises. By this stage in his life, Locher walked with the assistance of a cane. Photos of him from this time period capture a dignified man, handsome and refined. But the photograph of him I like the most was taken by Man Ray in the 1920’s when Locher was in his 30’s. In it, he sits with his left side to the camera, left elbow resting just above his left knee. The tips of his left index and middle fingers touch his chin and his steely eyes look mischievously into the lens. He’s youthful, willowy and as angular as a Picasso. Slicked hair hugs the top of his head, and the languid curves of his profile mirror the lines he incorporated into his art deco designs. Here, the photograph seems to say, is someone in the pursuit of beauty. A man who’ll explore the world, befriend great artists, apply his deft touch to a broad range of arts and crafts, and later bring that experience back to a Lancaster farmhouse, where it will impress itself on my elders, and through their fond reminisces, onto me. When I moved out of my Hell’s Kitchen apartment in 1999, I lugged the now flattened mattress down four flights of stairs and unceremoniously chucked it into a nearby dumpster. After four years, what little cushion it had had been squashed as flat as a slab of Manhattan sidewalk. 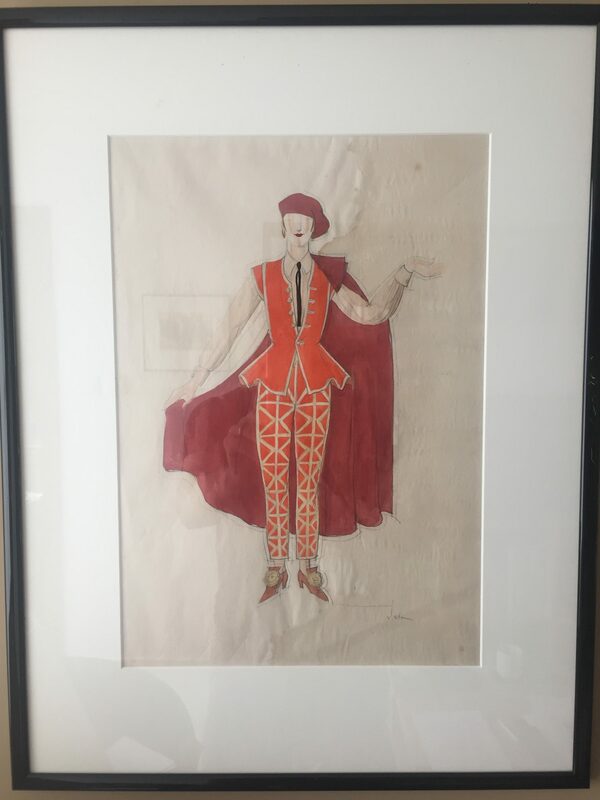 A few years later, thanks to the kindness of my parents, I inherited another one of Uncle Bob’s possessions: a framed draft of one of his early costume designs. In the watercolor sketch, a fanciful female matador wears an orange waistcoat, red cape and matching beret. 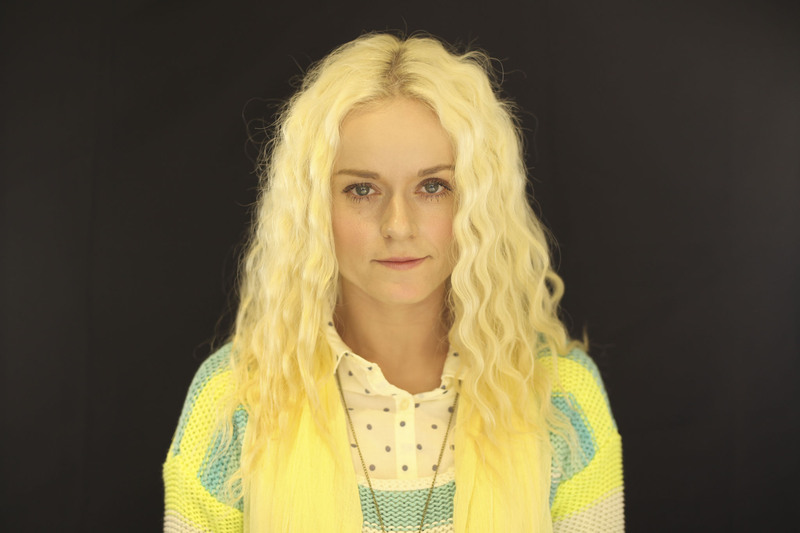 Bright red lipstick pops off her otherwise serene face. The paper on which it’s painted is water-stained, and unerased pencil marks provide an outline for the vivid colors, lingering evidence of the draughtsman’s creative process. I don’t know which play it’s from, perhaps the Greenwich Village Follies which opened at the Shubert Theatre in the summer of 1921. Regardless, it links the two us: our lives, our career paths. Separated by nearly eighty years, two young men who grew up in Lancaster, left the pastoral countryside for the dazzling lights of the big city, motivated both by our oversized dreams and the pursuit of art. Like Uncle Bob, I, too, eventually left New York. And, like him, I’ve sought out a life of adventure and creativity. Today I live in Hong Kong where I proudly display that framed sketch on my living room wall. It’s well-traveled, having logged thousands of miles, from New York to Hong Kong, via a nine-year stint in Los Angeles. On my more reflective days, I study its graceful lines, bold colors and the matador’s whimsical clothing. But more than anything I consider the woman’s body language. In a graceful gesture, she raises her left hand up and to the side as if inviting the viewer to walk down an invisible path. “Take this road,” she gestures, “You may not be able to see what lies ahead, but whatever you do, don’t stay where you are, because a life of excitement awaits.” Uncle Bob took that path and it’s in large part because of him that I did too. 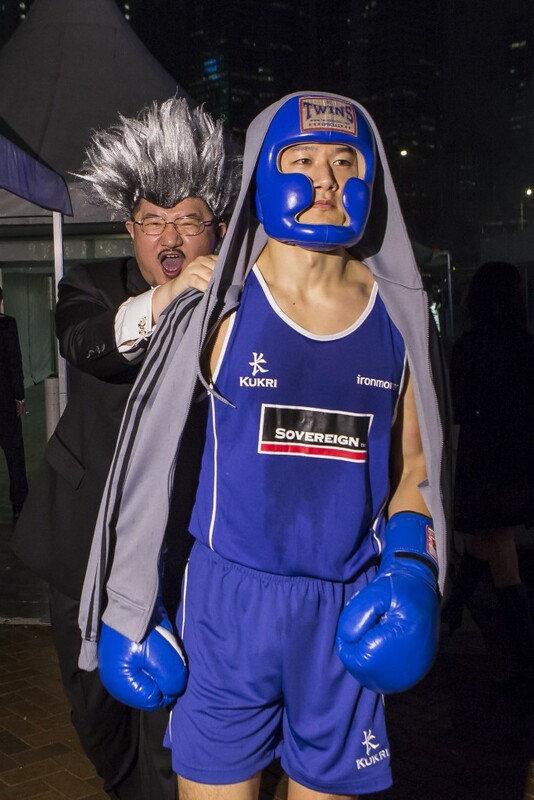 Financial stars fought under the stars. Some saw stars. Yup, that’s the best I can do. Photo courtesy of Michael Perini. The conditions don’t exactly match those of Williamsport, but that hasn’t stopped kids here from playing (and loving) the game. Severed heads and escaped convicts? 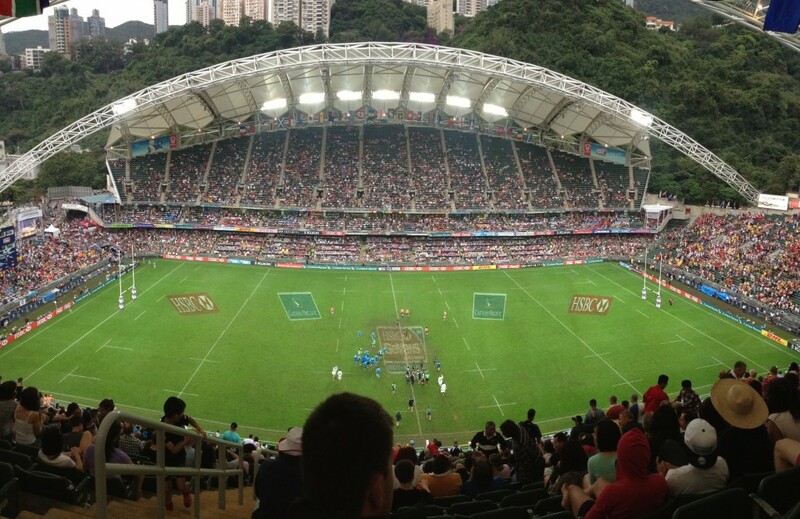 It can only be one thing: the Hong Kong Rugby Sevens. My latest radio story for Only a Game. Here’s my latest radio story for The World. It’s about Corinna Chamberlain, aka Chan Ming Yan (陳明恩), a Cantopop singer here in Hong Kong. 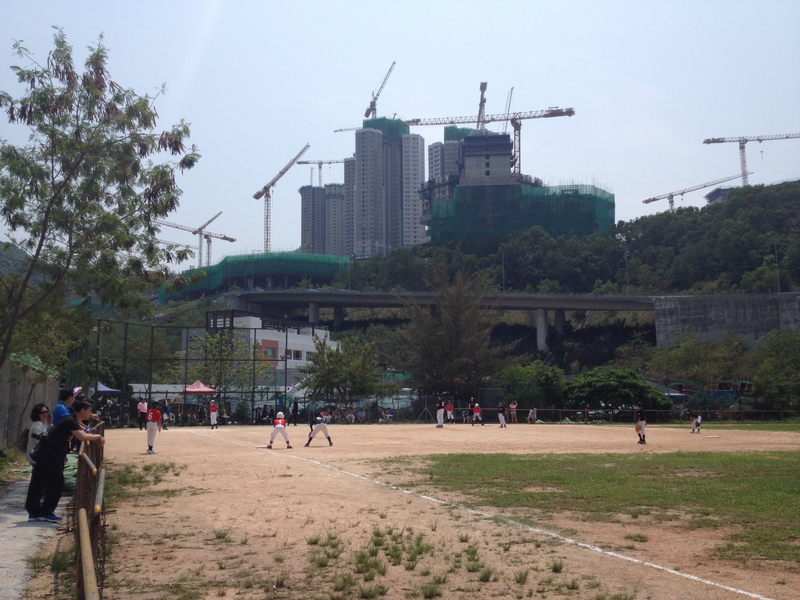 Here’s my most recent story for NPR’s sports show, Only a Game. 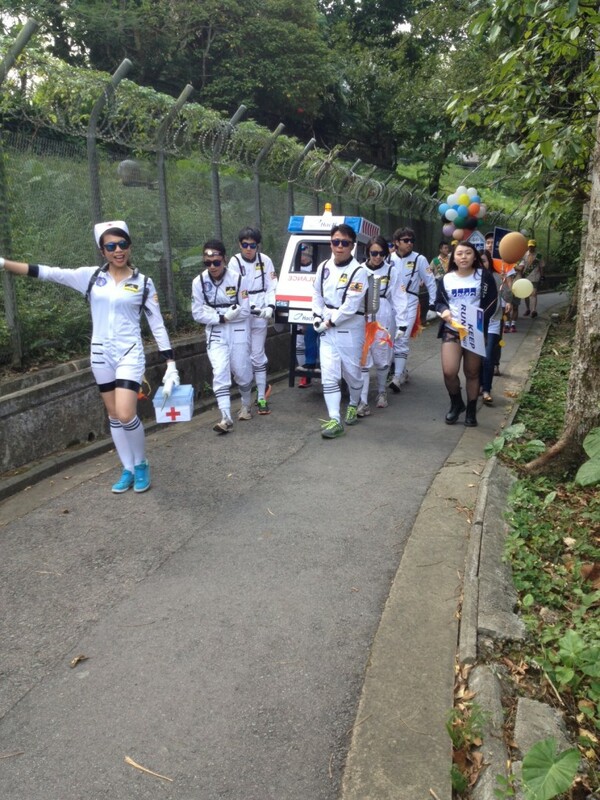 It’s about an annual race here in Hong Kong (香港) in which hearty souls race around Mount Kellett road carrying whimsically decorated sedan chairs. Of interest, sedan chairs were registered in the territory as late as 1962, according to this South China Morning Post article. For a photo of a reposing Air France crew enjoying the luxuries of a coolie-carried sedan chair, check out gwulo.com, a wonderful online repository of old Hong Kong. I didn’t know the tram at the end would contain the message it did.